The Las Americas golf course is strategically positioned in the heart of the main tourist area adjacent to Playa de Las Americas and Los Christianos, right beside the main road to the airport. Though apartments and villas surround the 18-hole property, the housing never interferes with sight lines enough to cause offence. Arranged in two returning loops of nine holes, the course measures a relatively modest 6,607 yards with a standard configuration of two par threes, two par fives and five par fours on each nine. The landscape gently slopes towards the coast, offering some pleasant elevation changes, particularly on the outward half. Water hazards are in play at several holes, but never to the extent that they dominate proceedings. A favourite stretch for many visiting golfers on the front nine starts at the right doglegged 2nd on the lower end of the course, continues at the 3rd, which has a creek running in front of the green, then the short par four, uphill 4th, leading to the intimidating par three 5th, with its small lake to the front left of the green. On the inward half, the 153-yard, par three, 13th is a potential disaster waiting to happen as its putting surface is surrounded on three sides by water. When the Las Americas and nearby Adeje courses opened in 1998, they doubled the number of courses in the southern tourist trap of Tenerife virtually overnight. Now, with the up-market Abama Resort having opened in 2005, golfers are absolutely spoiled for golfing choice in this part of the island as each of the five golf clubs in the area are geared up for holiday golf of a very high standard. I played Las Americas in mid May, having played it plenty of times over the years it doesn't disappointment. It isn't cheap (but they do deals including lunch outside of peak seasons) but the condition is always great, on this visit the greens did have a few too many blemishes from unrepaired pitch marks, sadly not much the green keepers can do if players don't repair them properly. Of the nines the front is the strongest with some nice elevation changes and a good mix of long and short par 4's, the holes at the top of the course being my favourites. The course is pretty good at managing players, we as a three ball got around in just over 4 hours which is good for a resort course. If you're visiting Tenerife certainly worth playing. Golf Las Americas is situated right in the heart of one of the busiest tourist areas on Tenerife and is therefore a very popular course. It may not be the best layout on the island and doesn't have the panoramic views of some of the other courses but Las Americas seems to make the most of what it has got. The greens were as good as anything we came across during the week and the immaculate presentation was second to none. Water comes into play on eight holes and if I had to choose I would probably pick the front nine as being slightly the better of the two halves. You will need to negotiate water on each of the first three holes, the 2nd all the way up the left and the 3rd again on the left and in front of the green. Both well designed and requiring some thought. The 5th is a cracking par-3 over water and you will need to carry it 170 yards plus to stay dry unless you bale out right of the green. The 6th is a solid par-4 from a raised tee and the 8th is also a good par-3, anything left will be amongst the brightly coloured shrubbery and anything missing right tumbles away down the hill. The 13th is yet another good looking par-3 over water and the 17th is a short but pretty par-4 curving all the way around an attractive water feature up the right. The facilities here are also worth a mention with a very good clubhouse, practice range and one of the better pro shops on the island. We stayed at Las Madrigueras which is situated by the 4th fairway. A lovely hotel which offers discounted green fees. Nice course with a nice lay-out. I was really impressed to find such course in the middle of a crowded touristic area. 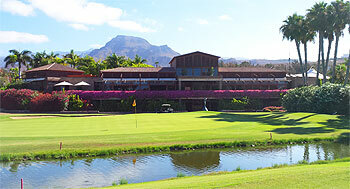 When in Las Americas/Los Cristianos you have to play here for a round of good holiday golf fun. I did read the reviews below about how crowded the course can be. An early tee time might solve this problem. I’ve played at this pay-and-play golf course several times now and really enjoy it for what it is – holiday golf of the very highest order (with a very impressive clubhouse thrown in for good measure). The front nine has a great run of holes from the 2nd to the 5th and it ends with a tricky downhill, doglegged short par four. The back nine holes are a little less demanding (except for the par three 13th where a good round can easily come unstuck) though they will still retain your interest all the way to the 18th green. Conditioning is always top class and with year round playability on the island of Tenerife, it’s no wonder Las Americas is always busy whenever I’ve been here – just be prepared to join another 2 or 3-ball if you’re a single as tee times can be limited.